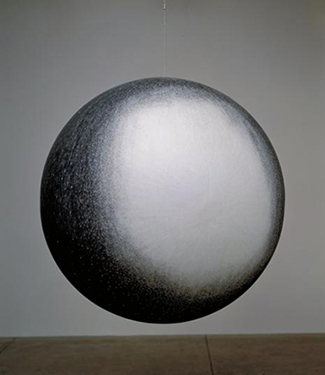 Russell Crotty, M15 Globular Cluster in Pegasus, 2001, Ink on paper on fiberglass sphere 45 inch diameter, Collection of MOCA Miami. 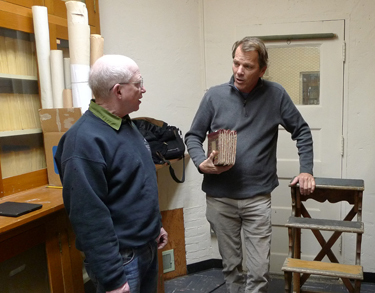 Russell Crotty in the Lick Observatory Archive discussing the history of astronomy at Lick with Tony Misch, director and curator of the Lick Archive Collection. 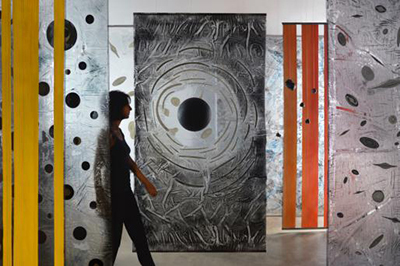 Look Back in Time: Russell Crotty and Lick Observatory, the first traveling exhibition of the UC Santa Cruz Institute of the Arts and Sciences (IAS), opens November 13 at the San Jose Institute of Contemporary Art (ICA). The exhibition offers a look at astronomy and the celestial cosmos through two distinct lenses—one artistic and contemporary, the other scientific and historical. It joins the work of Russell Crotty, an artist with an abiding passion for astronomy, with an installation of never-before-exhibited artifacts and images from one of the nation’s most historic observatories, UC Lick Observatory on Mount Hamilton. The title of the exhibition has a dual meaning. First, it refers to ‘lookback time’--the fact that the light that reaches our telescopes shows us images from the past--the greater the distance the light has traveled, the older the image. Second, the exhibit looks back at the early years of astronomy at Lick. Crotty is known internationally for his drawings based on direct astronomical observation, and for works on landscape, the ocean, and surfing. This exhibition premiers a large-scale, site-specific installation, created in response to his time as an IAS artist-in-residence at Lick Observatory and UC Santa Cruz. Look Back in Time also digs into the history of astronomy, unveiling an array of artifacts from Lick’s historical collections. Selected and displayed in an installation created by the Observatory’s collections director, Tony Misch, these artifacts provide a look into the processes of late 19th and early 20th century observational astronomy. 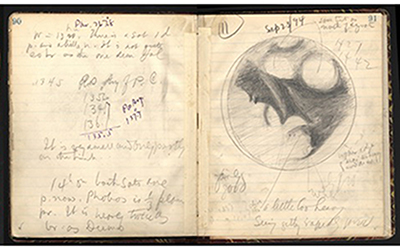 “The instruments, photographic plates, and written records in Lick's historical collections conceal a special poetry in their documentation of the laborious and painstaking work of astronomical observation,” noted Misch, co-curator of the exhibition with Crotty and IAS director John Weber. “This wonderful opportunity to exhibit the archival materials in an art gallery context invites viewers to reflect on astronomical data-gathering, with all its precision and quantitative rigor, as the creative work of individual hands and minds,” he added. The Look Back in Time exhibition is the culmination of an innovative two-year collaboration between the ICA, IAS, University of California Observatories (UCO), the Lick Observatory Historical Collections Project, and Theoretical Astrophysics Santa Cruz, a faculty working group at UC Santa Cruz. Kimball collaborated on the exhibition’s concept and extended the original invitation to the IAS to develop a joint project. 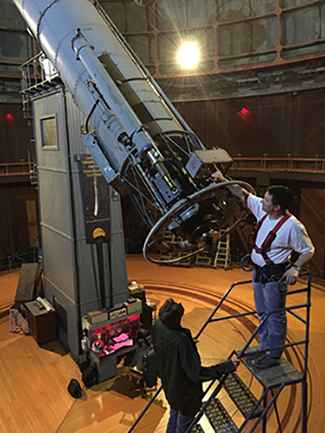 When approached by the IAS about an exhibition, Crotty was attracted by the once-in-a-lifetime opportunity to work with modern and historic telescopes at Lick, gain access to its historical archive, and engage with astronomers and astrophysicists both at Lick and on campus. Along with repeat visits to the observatory, he met on campus with faculty involved in theoretical astrophysics to discuss their work. He visited the Lick Shops on campus where telescopes are designed, optics fabricated, and instruments built. He toured the Center for Adaptive Optics where the next generation of AO technologies is being pioneered. And he met with art classes. Crotty also helped plan and present an intensive, two-day art and astronomy workshop for undergraduate art and science students at Lick Observatory. The result of his time at Lick and on campus is a new installation based loosely on current theories about the development of the universe, from just after the Big Bang to the present. Crotty’s new piece takes the form of an immersive, walk-in environment that includes drawing, sculpture, and fabric scrims coated with bio-resin. It will be on view for the first time at the ICA, together with a group of Crotty’s earlier work, selected by the artist to relate to areas of the cosmos studied historically at Lick. "What we have created together is a show that combines the contemporary with the historical, and art with science history,” noted IAS director John Weber. “There are a lot of stories in this show, which is ultimately about the incredible drive humankind has had to understand the nature of the universe itself, and to express it. Lick Observatory expresses that drive, and so does Russell's work." In addition to the historical focus of the exhibition itself, a series of talks will also look at some of the groundbreaking scientific work that continues at Lick. Visit ias@ucsc.edu for more information. “Look Back in Time: Russell Crotty and Lick Observatory,” the first traveling exhibition of the UC Santa Cruz Institute of the Arts and Sciences (IAS), opens November 13 at the San Jose Institute of Contemporary Art (ICA) with a free public reception from 2 to 4 p.m. Running through February 19, 2017, the exhibition is funded by grants from the Andy Warhol Foundation for the Visual Arts, the National Endowment for the Arts, the McEvoy Family Fund of the IAS, and annual donors to the IAS and the ICA.